Update: Thanks to some observant and kind readers, I was notified of a mistake in the recipe printout! For some, the recipe showed 2 1/2 tsp of baking soda but it should read 1 1/2 tsp, otherwise you get a biscuit instead of a cookie! The amount of sugar was also off and should have read 1 1/3 cups instead of 1. It’s inevitable that whenever we see a good family movie my kids start counting down the days until they can see the movie again. They beg to go back to theater but we never do! When a commercial comes on with a the movie trailer, they always ask, “Mom, are we getting that when it comes out on Blu-Ray?” When you’re young, it’s so hard to wait, right? But who am I kidding, it’s not easy to wait around for good things as an adult! 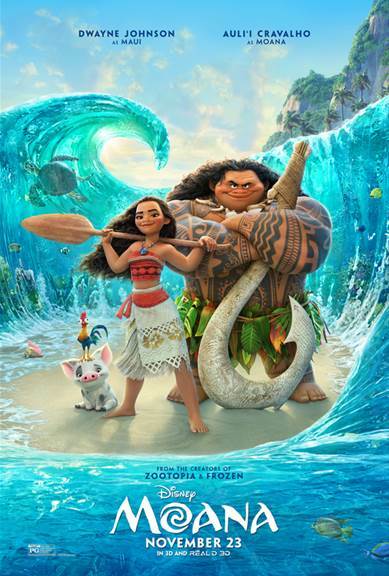 “Moana” is one of the movies that my kids have been anxiously waiting to get their hands on. And finally, today is the day! My oldest will come home from school to a fun surprise, a new movie and these pineapple sugar cookies as fun treat to munch on while we watch the movie. I’m thinking it will be good motivation to get them to do their chores and get their homework done! Mom for the win! I absolutely adored “Moana”. As a family history enthusiast, I enjoyed the messages of knowing where you come from in order to face the challenges you have now. Moana had to look to her ancestors for their courage, strength, and determination to perform a near impossible task. And she helped teach the demi-God Maui along the way. While I love the song, “How Far I’ll Go”, I remember getting chills hearing the “Song of the Ancestors”. I’ve been digging deep into my roots and it stirred a desire to keep on finding my heritage. And not just their names and birth and death dates. I want to more about them and how their stories have led to where I am today. It’s powerful! If you have favorite family recipes that you’d like to preserve, along with the memories associated with them, Family Search has some great ideas on how you can do that. Don’t let those memories slip away! I wish we had written down recipes from my grandfather and even great-grandparents before they passed away. With them gone, the recipes are lost too. I love that you can share how it’s been altered over the years as that’s a part of a history as well. The island Moana lives on is lush and beautiful, a perfect paradise with people who love and care for each other. But their traditions were forgotten and Moana is the first in a long while to find out where her people came from. We may not all live on a beautiful island paradise but we can still find stories in our history and find ways to preserve them! And one of those ways is through food. I’m sure most of us can think of one recipe that has a story behind it, something that has been passed down from one generation to another. These pineapple sugar cookies are a newer recipe for our family but I’ve made it with my kids and started a new memory. These cookies are just that! We love how moist they are, with a little hint of pineapple that makes them unique and memorable. They whip up quickly too! My boys love helping me in the kitchen. I hope they’ll remember these recipes that we make together and pass them on their children one day. It’s strange to think it, but I could very well end up teaching these recipes to my grandchildren. You can definitely eat these cookies on their own. But if you pair them with this lemon cream cheese frosting, you’ll feel like you’re in your own little island paradise. Grab the recipe below and start whipping up memories in your own kitchen with Pineapple Sugar Cookies! 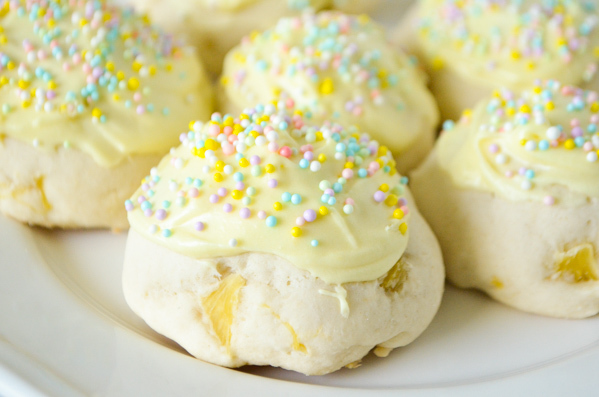 Delicious sugar cookies are moist with a hint of pineapple! Add in vanilla and eggs. Sift flour, baking soda, and salt together in a separate bowl. Add flour mixture gradually to egg and sugar mixture, until a soft, somewhat sticky dough forms. Drain pineapple well and fold into cookie mixture. , Drop by teaspoonfuls onto a parchment lined cookie sheet. If you like the cookies flat, you can press down on them with your hand or the bottom of a glass. Bake at 350 degrees for 10-12 minutes until cookies are golden brown around the edges. Frost with lemon cream cheese frosting once cooled or enjoy on their own! 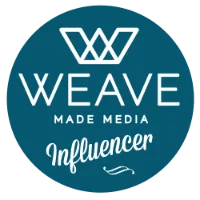 Be sure to check out these fabulous projects and recipes to give you more inspiration for celebrating “Moana”‘s release!